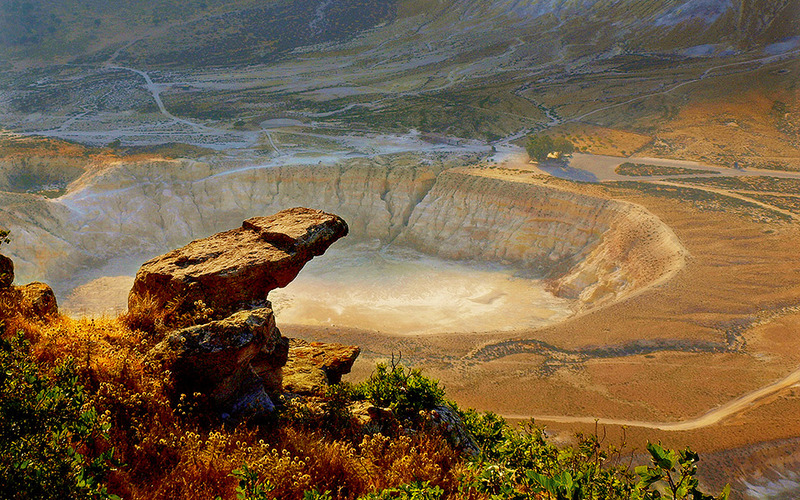 The other-worldly nature of the crater Stefanos, seen here from the top of the caldera, is an endless source of inspiration. The youngest of Greece's volcanos, Nisyros is also the most captivating – an endless source of fascination for scientists and inspiration for artists and inquisitive travelers. Visualize the scene: above the Aegean Sea, the war between the Giants and the Olympian Gods is raging. Poseidon, the god of the sea, is giving chase to a giant by the name of Polyvotis. When he finally catches up with him, near Kos in the south-east, he uses his trident to tear off a chunk of the island, which he then catapults on top of Polyvotis. This piece of Kos becomes the island of Nisyros, trapping the hapless giant underneath – an eternal prisoner of the Olympians, forever groaning and puffing in anguish in his effort to break free. This is at least how the ancient Nisyrians sought to explain both the regular earthquakes occurring on their island and the fumes that rose from the earth. Modern science, of course, has a different story to relate: one about a volcano that, having started its life underwater, started to emerge from the sea about 150,000 years ago. Over the next 135,000 years, a series of magmatic eruptions both great and small formed an island-volcano similar in shape and size to the Nisyros we know today. When Neolithic man inhabited the island some 6,500 years ago, all magmatic activity – the result of which is molten rock – had ceased. The only eruptions witnessed by those primitive people, and all subsequent inhabitants in historical times, were hydrothermal. These occur when the hot fluids under the earth’s surface produce so much steam that the layers of rock buckle under both the pressure and the concurrent earthquakes, popping like the lid of a pressure cooker and expelling steam, gas, mud and rock. View of the caldera with the village of Nikia standing guard over the crater. 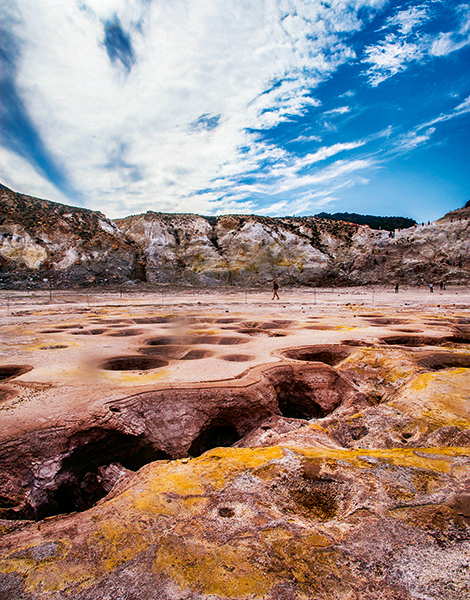 Sulphur crystals form around the fumaroles, painting the Stefanos yellow. Don’t try to collect them for they will crumble to dust immediately. The “legacy” of all those hydrothermal eruptions to future generations were the circular craters that are nowadays so popular with tourists. Of the 20 traced on the island, the largest, most imposing and most visited of all is the approximately 4,000-5,000-year-old Stefanos, known simply as “the volcano.” Elliptical in shape, with a diameter ranging from 260m to 330m and 27m deep, Stefanos is in fact one of the largest and best preserved hydrothermal craters in the world. Its fumaroles (the holes in the ground) are still puffing hydrogen sulfide and the water under the surface boils at corrosive temperatures. This serves as a reminder that even though Nisyros has not given any indication of magmatic activity for thousands of years, it is, nonetheless, a potentially active volcano. Therefore, a hydrothermal eruption following an earthquake is not out of the question. This is why there is a permanent observatory on the island to monitor earthquakes and volcanic activity. And still, no rotten-egg stench or risk has ever deterred – or should ever deter – visitors from making a pilgrimage to this most hospitable of Nisyros’ craters, or to any of the island’s craters for that matter, if only to experience up close the earth’s inner workings. Such visits are a once-in-a-lifetime opportunity, given that craters are rarely accessible and at most volcano-hosting destinations one can, at best, enjoy the view from the top of a caldera. 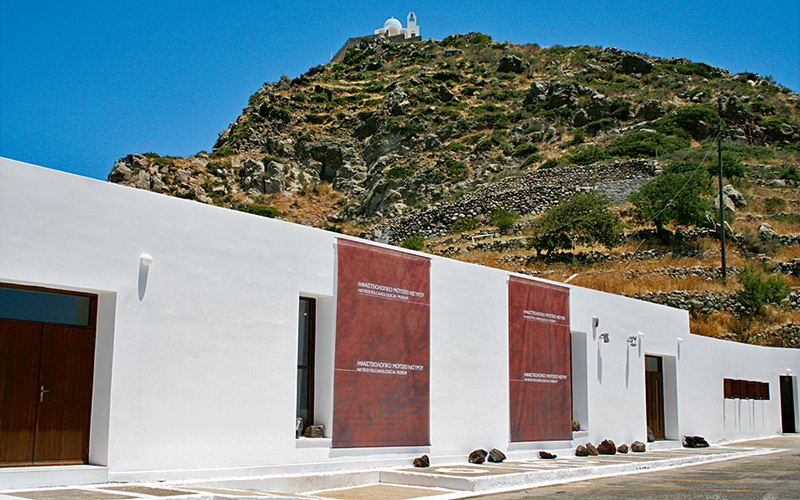 Nisyros, however, is unique in that it is accessible in the same way a museum is – in this case, an open-air geological museum. 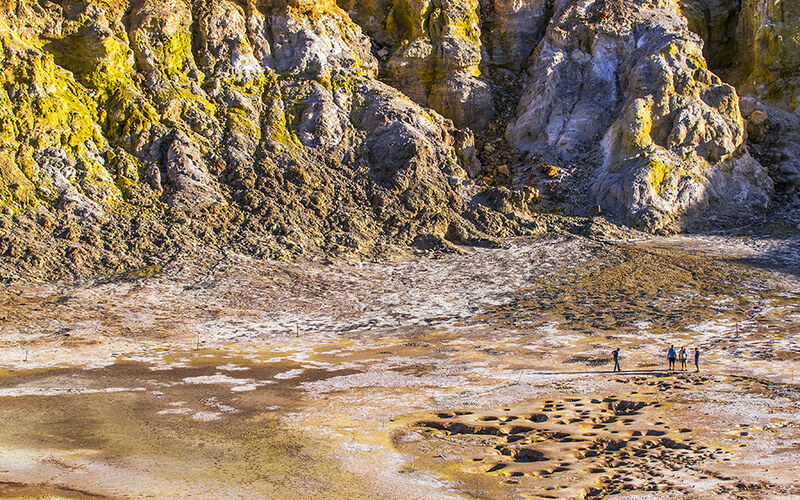 And to geologists and volcanologists, it is in fact one; its young age (150,000 years is very recent in geological terms) and its inactivity allows them to easily trace the volcano’s formation from the exposed rocks. The inactivity of this relatively young volcano allows you to trace its history through its exposed geological features. 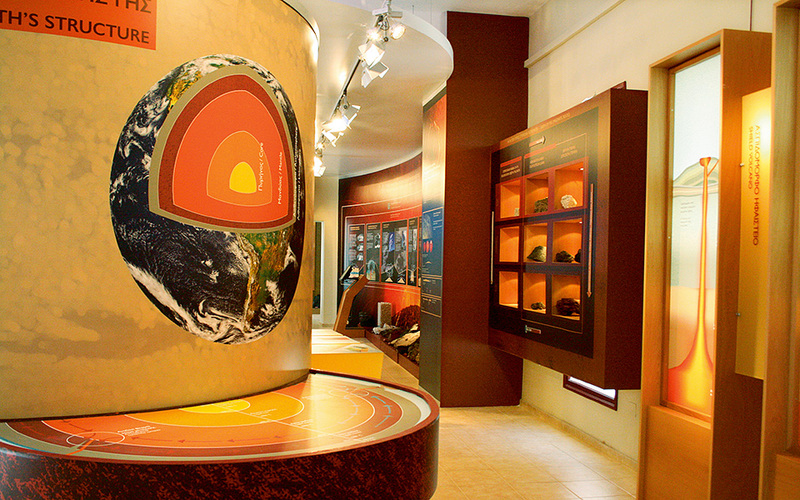 The island's volcanological museum offers visitors the chance to learn all about the local volcano and others across Greece. 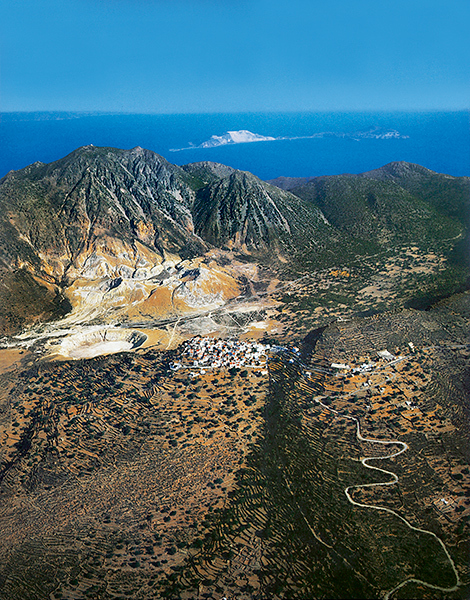 From students to geologists and artists, the museum caters to all those fascinated with Nisyros' resident volcano. No geologist or geology student, however, seems to find the island-volcano more intriguing than the visiting artist. Be it either the out-of-this-world landscape of its craters or a strange fascination with the earth’s potentially destructive nature, artists have returned over and over again seeking inspiration. Greek director-producer Eleni Alexandrakis first visited the island 30 years ago and has not stopped returning ever since, “magnetized,” as she says, by its volcanic energy. She has filmed several scenes on the island, while her film “Angel and the Weightlifter” (2008) was shot almost exclusively inside Stefanos. In fact, Alexandrakis is so fascinated by volcanos that, for the past two years, she has been organizing a summer film festival of sorts called Ifestiada in the village of Emporios, where she screens films and documentaries relating to volcanos. Other visual artists, including fellow directors as well as photographers and painters, have also used the volcano as a muse, though nothing seems more impressive than how a volcano can inspire music. Last summer, in fact, a unique, one-night-only experimental musical encounter took place in the Stefanos crater. Under the August full moon, 15 young Greek musicians met for the first time and improvised for exactly 10 hours and 34 minutes (the length of time between sunset and sunrise), composing on the fly a lengthy music piece inspired by the unique volcanic scenery around them. “The place has an incredible, primordial vibe. You could feel the earth boiling underneath you, hear the hissing of the vapors,” recalls pianist Tania Giannouli, who participated in the event. And if a volcano’s ability to inspire seems too intangible or even metaphysical a notion, a visit there is very likely to stir the inner artist of the most prosaic of people. But even if your creative genius fails to bubble to the surface, you will have been a guest of one of Greece’s most eloquent of geological hosts, which is certain to make you ponder on human powerlessness when faced by giants.